From just under $30 to a bit of a splurge at $1000, I’ve narrowed down the best espresso machines you can buy this year. Whether you love user-friendly capsule machines or you’d rather learn barista skills, here you’ll find my picks for the best espresso machine that fit any home and any budget. Although it doesn’t technically make real espresso, Moka pot is one of the most popular little brewers. It doesn’t require counter space, it’s affordable and it’s hard to mess up. Moka pot can’t produce good crema, but what you’ll get is a very nice concentrated brew very similar to espresso. It’s perfect for occasional espresso drinks, recipes that call for espresso, or for those who like strong morning coffee. 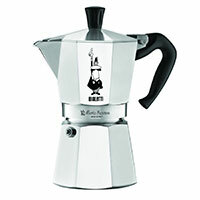 I recommend the Bialetti 6 cup Moka pot. A nice small espresso machine with a steam wand can be a good place to start. Not the most durable option but it’s good if you want to learn the basics and make espresso at home without breaking the bank. 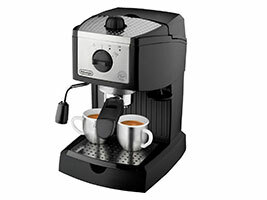 DeLonghi EC155 is one the most popular machines from this category. It has a plastic case, 35 oz removable water, stainless steel boiler and 15 bar pump pressure. The steam wand works pretty nice and fits larger pitchers. It has a pressurized portafilter which is perfect if you’re just starting out. If you want a machine that will do all the work for you, capsule espresso machine is ideal. No grinding, dosing or tamping – just insert the pod and press the button. There are several different brands, but I would recommend Nespresso. They have a very nice choice of pods (you will need to order them online) and they make the best crema. 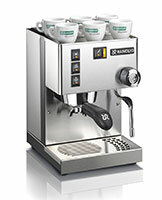 You can get a model that makes only espresso like Inissia, or VertuoLine which makes both, espresso and regular coffee. Good quality and performance, at a reasonable price?! You might like the Breville Infuser. This machine makes really good shots, but it’s compact and won’t take up lots of counter space. The Infuser has a stainless steel case, a stainless steel boiler, 61-ounce water reservoir, 15 bar pump pressure, built-in PID which keeps the water temperature stable, single and double shots and programmable shot volumes. It works with pressurized and non-pressurized portafilters and you can swivel the steam wand for easy frothing. The machine automatically adjusts water temperature after steam for optimal brewing temperature. All these options will help you make constantly good espresso at home, no matter what your level of experience is. This machine comes with a huge number of accessories: a portafilter, milk jug, cleaning tablets, backflush disc and water filters. Complete solution from bean to cup! The Breville Barista Express has a built-in grinder and makes seriously good espresso in just a few steps. This machine has a significant number of features: stainless steel boiler, 15 bar pump pressure, built-in burr grinder, 67-ounce water tank, built-in PID, single and double shots and programmable shot volumes. It has a water temperature control (4 degrees up or down from the factory settings) and auto-purge function which returns the machine to an optimal temperature after steam. The machine works with pressurized and non-pressurized portafilters. Barista Express comes with a 54mm portafilter, filter baskets, a tamper, milk jug, cleaning tablets and disc, a cleaning brush and water filters. If you want simple controls and espresso machine that makes great shots, the Barista Express is perfect. It’s a great choice if you’re a newbie. It’s beautifully built, and the price point at which these features are offered is really good. You just keep it nice and clean and it should serve you perfectly for many years. Rancilio Silvia is perhaps the most well-respected home espresso machine on the market. This machine is sturdy, reliable, powerful and it can be modified. Rancilio uses a lot of the same parts in this machine that they use in their commercial machines at that’s why it’s so good. 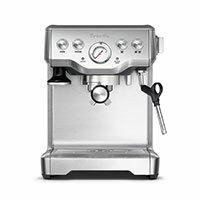 Commercial-grade features include stainless steel casing, brass boiler (lead-free), removable heating element, 67-ounce water tank, 58 mm heavy-duty portafilter (non-pressurized), super powerful steam wand, hot water on demand, 3-way group solenoid valve which dries the portafilter for easy cleaning. This is a great machine to learn your Barista skills on. There is nothing automatic about it. It will take a few tries to get a consistent shot, but after you figure it out it will work great. To get the most out of this machine, you really need a good burr grinder ($250-$350). Overall, Rancilio Silvia is a great espresso machine for home. 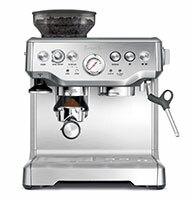 It makes excellent espresso shots and microfoam and is well worth the price. If you want a serious home espresso setup for under $1000, and you want equipment that’s built to last, Rancilio Silvia ($685) and Rancilio Rocky grinder ($350) are a good bet. Soo…. We just bought a new house. So to go with I figured I’d buy a shinny new coffee/espresso machine to set off the kitchen. I had my Verimo for Two moths and I am just able to use it .. followed all the first time use instructions and when I go to rinse, brew or anything, the button flash white. What’s my deal? Hi Torry, congratulations! The single button should blink when the machine is executing an operation. For example, when you press the brew button, the button will start blinking and it will flash until it’s done brewing. It’s the same with the rinse button. Can you make the drink? If the machine is working fine, it dispenses the drink and the rinse button is working, and it only blinks during the operation the machine is working properly. Great post! but to be honest, the Bialetti 6 Cup Moka Pot still is my best bet! If you’re okay with the hassle of manual brewing, this age-old relic stands out among the rest! Imagine it was invented in the early 1930s and it’s still working well! Not that I hate modern coffee makers, there is just something so distinct with the Moka Pot. The aroma, the flavor, the consistency, I am just in love with it, to be frank. Thanks for sharing your recommendations! When picking an espresso maker for many it’s a balance of not wanting to spend too much money, but also investing in something that is good quality and value. Delonghi is definitely in that bracket but at the same time machines like Breville have the advantage of longevity and quality in the long term. I like the Nespresso quite a bit, but find that many of the capsules taste the same. The Gagglia is also a favorite of mine in this price category, but a bit hard to find. Thanks for sharing such a detailed and thorough review! It is tricky to balance affordability with quality when it comes to espresso machines. We may be a bit biased but we definitely like Nespresso’s espresso machine, our Nespresso compatible pods work very well with it and always produce a delicious brew! Hi Glenn, you can find parts for your Saeco machine at Philips US website https://philips.encompass.com/brands/SAE/Saeco . Personally, I would choose a Poemia. In my opinion, it pulls out better shots, froth results are better and in general, it seems more reliable than EC702. If you prefer DeLonghi brand, then I would rather get the EC155. It’s as good as EC702 (if not better), and you can get it for less than $80. I mean, we can’t expect to get a top quality machine that will last forever for $200 but unless you really like the 702 there’s no need to spend extra $80-$100 because it doesn’t offer any important extra features. Of course, that’s just my opinion. I’m sure you’ll make a great choice. All the best. I’m looking to buy my wife an espresso/latte machine. I was looking at the Revo, but I noticed on your review you mention you have to use coffee pods and can’t use your own coffee. You did mention in the same review that you can use your own coffee with a reusable pod on the nespresso. 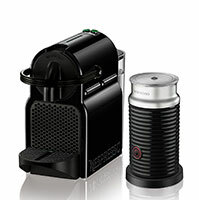 Do you know if you can use a reusable pod on the Nespresso CitiZ Espresso Machine and Aeroccino Plus milk frother? If so, do you know where to get the appropriate reusable pod? Thank you…I don’t drink coffee and know nothing about it so I appreciate your help!! Awww, that’s a lovely gift Howard. I think that Citiz and Aeroccino are a great combination. The problem with these pods is that it’s not sold/ made by Nespresso. That’s why I can’t guarantee or recommend a specific replacement 100%. Sometimes they work good sometimes they don’t work at all. But, with Nespresso machines you at least have this option and some solution will probably fit. There’s not any type of reusable pod for the Rivo, so with this in mind the Nespresso is a better option. The fact is that the optimal and the most convenient way to use machines like Nespresso or the Rivo, plus have a quality cup of coffee, is to use the original pods. In fact, even if you don’t use the refillable option, you will probably save with Citiz. Rivo pods cost $0.83 per pod, and Nespresso $0.65 per pod. I know it’s kinda long and confusing but I know this is important, I hope this helps. All the best and let me know if you need anything else.